Difference between revisions of "City"
'''City''' is the fourth [[London]] level in [[Tomb Raider III]], in which [[Lara]] has to fight against [[Sophia Leigh]], who had found one of the missing artefacts. Using [[pistols]] against her will do no harm, the only way of a successful completion of the level will be using electricity against her. The [[Eye of Isis]] is left behind after her demise. '''City''' is the fourth [[London]] level in [[Tomb Raider III]], in which [[Lara]] has to fight against [[Sophia Leigh]], who had found one of the missing artefacts. Using [[pistols]] against her will do no harm, the only way of a successful completion of the level will be using electricity against her. The Eye of Isis is left behind after her demise. 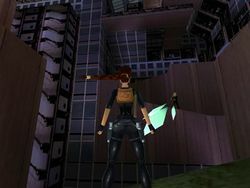 City is the fourth London level in Tomb Raider III, in which Lara has to fight against Sophia Leigh, who had found one of the missing artefacts. Using pistols against her will do no harm, the only way of a successful completion of the level will be using electricity against her. The Eye of Isis is left behind after her demise. This page was last modified on 29 June 2011, at 12:00.